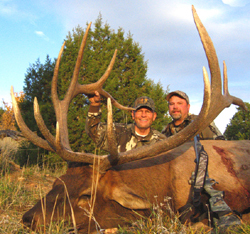 Black Timber Outfitters is the Premier San Juan Elk Hunting Guide in Southern Utah. 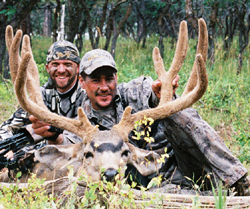 They also provide trophy hunts on the San Juan Elk Ridge mule deer unit. Black Timber Outfitters (BTO) is a small outfitting business specializing in just a few hunting units close to home. The San Juan elk unit of southeastern Utah is considered by many to be one of the best trophy areas in the country and BTO routinely takes bulls in excess of 380" from this unit. The San Juan Elk Ridge deer unit is also well known for producing some giant bucks. BTO has been able to deliver here as well, consistently producing bucks with antlers scoring over 170". BTO operates only on these two hunting units and by focusing their efforts on these areas of southeastern Utah, they have become the local experts and they know it better than anyone. To the elk hunter, drawing a permit for this area is a dream come true that not many get to experience. With thousands of hunters applying, the odds of drawing one of the trophy bull permits can be quite difficult. However, for those that draw, it is certainly worth the wait. Elk scoring over 400" are taken every year on this unit as well as Mule deer scoring over 190". The San Juan, Elk Ridge area's mule deer struggled during the drought years, but is on the rebound and Black Timber Outfitters is perfectly positioned to take advantage of the improved trophy potential. Living within a short drive of the area allows them to scout the elk and deer all summer long. They also operate on a couple Cooperative Wildlife Management Units that are near by as well. These are private land units where several guaranteed vouchers are available each year. Black Timber is a fully licensed guide and outfitter under Utah state law. License # 7563545-7501. Check out their website at Black Timber Outfitters or contact Hunters Trailhead for more details.